Before opening the Beech Tree and working with a bonafide Chef, I did a lot of home cooking. In fact, I did all the cooking in my household. This is largely what got me started on the road toward a new career in the hospitality industry. Cooking wasn’t enough; I also felt a need to express myself in some way – to share my passion and interest in food with others. So, I did what everyone with a hobby does: I blogged about it. After a brief hiatus, I picked up the blogging again early this past summer. However the nature of my writing has changed in the sense that I now largely write about restaurant-related subjects. The Beech Tree project was so involved and time-consuming that I found I wasn’t cooking as much at home as I once had. Over the last few weeks of the summer, I have been able to go home to cook and sup with the family a lot more frequently. ‘The Tree” has been humming along nicely in the very able hands of my excellent staff. I have happily rediscovered my home kitchen, but this time I have a new set of gastronomic data banging around in my brain, gleaned from watching Chef at work in the restaurant kitchen (and sometimes cooking along side him). I have learned to use herbs with more precision, that brining is essential for certain types and cuts of meat and that a good sear sometimes makes all the difference between wow and meh. Layering of flavours is essential – if you can inject flavour at any step of the process, do so. At the same time flavour combinations need to make sense, to have some intelligence and to not be cluttered and confusing. Myths have been dispelled as well: Thomas Keller’s ‘big pot blanching’ doesn’t really seem necessary for brightly coloured veg. A highly charged soda siphon will not make a proper pickle in two hours (we tried it). Really good pasta can be produced without using Double Zero flour. I also learned that seemingly revolutionary ideas in many of the cookbooks I have read are actually pretty standard procedure in most good restaurants. Cooking at home, of course, is different than a restaurant with paying customers and Yelp reviews, but that doesn’t mean one should feed their family mediocre food does it? So, in order to continue this aspect of my culinary interest, that being the home kitchen, I will be starting a reoccurring series of blog postings that capture the streams of consciousness behind my home cooking and will include some recipes. This is the kind of cooking that, while amateur and many levels removed from the magic that our Chef can conjure, also reflects my restaurant’s overall food ethos: seasonality, nose-to-tail butchery, quality ingredients from sustainable sources and a general sense of respect paid to both the raw materials that go into the dish and the intended delight that they bring to the diner. On a small scale, this can be done at home and given the wealth of cookbooks lining store shelves these days, it is clear that people are interested in upping the quality of home cooking, light years removed from the hamburger-helper-tuna-caserole-boiled-to-death-vegetables of our youth. I think we may be seeing a major cultural shift in the North American home kitchen…at least I would hope so. One of the things I love about cooking with seasonal ingredients is the anticipation for the next new thing. So, back in June, when I couldn’t cope with even looking at another sprig of asparagus or shell another fava bean, tomatoes and zucchini appeared at the green grocer. Hallelujah! Well, it is now September, and I am officially done with zucchini. I’ve cooked them in a million different variations this summer; I’m ready for the next thing. Autumn has a lot to offer, but one of my most favourite arrivals is the borlotti bean. Right, I know what you’re thinking. What the heck is a borlotti bean? In Canada they are called ‘romano’ beans, but all the recipes I have for this ingredient comes from U.K-based chefs. I like their name better. I know it’s a bit presumptuous, and possibly silly, to refer to zucchini as ‘courgettes’ or eggplant as ‘aubergine’ or arugula as ‘rocket’. For some reason, in North America, we’ve stuck with the Italian terminology while the English have used more French terms (probably a hangover from the Norman conquest of 1066 AD) In any event, there is one exception I will make in my culinary nomenclature, that is, this wonderful bean called a borlotti. (to further confuse matters, some people call this a ‘cranberry’ bean). 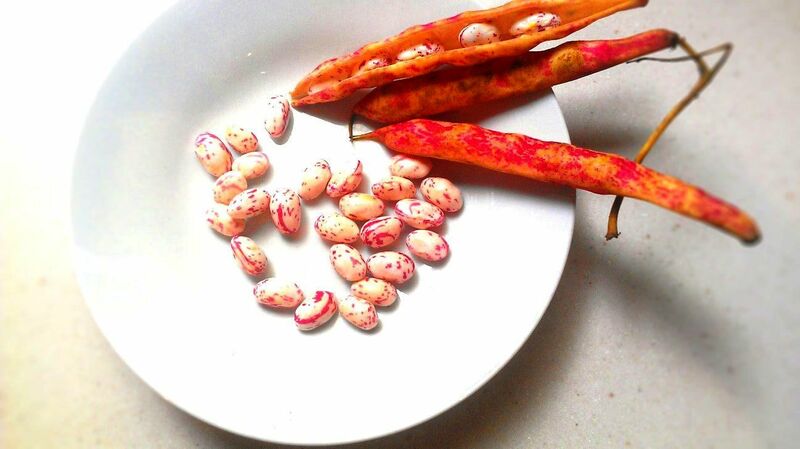 Despite the differences in names, this bean is one of the most beautiful foods that can be grown. The pod is crimson, green and gold tiger stripes. Hidden inside, like the speckled eggs of a tiny bird, are the beans themselves. They are the colour of Devonshire cream with dabs and flecks of claret-wine red. Every year, around late September, these beans start popping up in the green grocer shops of little Italy. My office is located between Kensington Market, Chinatown and Little Italy – just about the best location, gastronomically speaking, in the city of Toronto. The recipe I used for these beans comes from Gill Meller, the head chef at River Cottage’s Park Farm in England’s west country. His original vision was of a sort of salad, whereas I applied mine as an accompaniment to a simple roast chicken. To avoid bean explosions during cooking, a gentle soak in fresh water over night is often recommended for dry beans – because these beans have come fresh from their pod, this is not a necessary step. This is a wonderfully rustic dish that goes quite well with many other roast dinners. The charred onions and shallots are rather chunky and when gently folded in with the hearty beans, create some textural interest. It’s pretty healthy to boot. The one unavoidable draw back is that the heat from cooking will tragically kill the beautiful cream and crimson of your beans, leaving them an uninspiring murky brown. Because of this, fresh herbs are essential to add colour to a relatively monochromatic, albeit tasty, dish. Get your beans in a sauce pan, cover with fresh water and drop in the 2 sprigs of thyme and 2 bay leaves. Bring the water to a boil, and drop the heat back a wee bit to an enthusiastic simmer. Cover and allow to gently cook for about 35 minutes. In the mean time, peel your onions and shallots but do not remove the root (it will hold them together). Quarter the onions and shallots and get into a small roasting tin with the garlic, oil, the red wine vinegar, and the remaining bay and thyme. Toss everything together with some salt and pepper and cover with foil. Roast in the oven at 400F for about 25 minutes, then remove the foil and roast for a further 15 to 20 minutes. The onions will soften and start to caramelize. When you’re happy with the doneness of your onions and the beans are soft and yielding, go ahead and assemble the dish. Strain the beans. Get rid of the bay leaves and the thyme sprigs and combine the beans with the onions. Fold them together and drizzle in the balsamic vinegar and add the parsley. Adjust the seasoning for taste and then finish with a bit of your best olive oil. Serve hot.